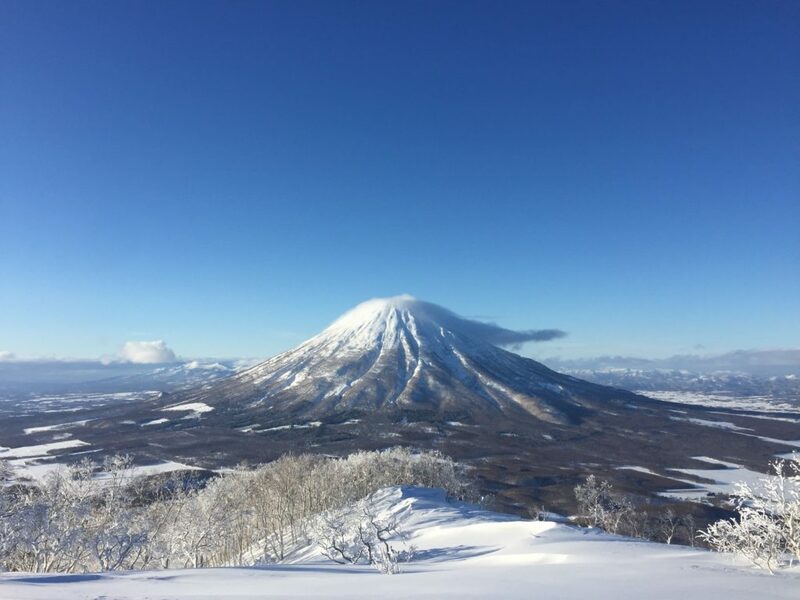 For three winters I have lived and worked in Niseko, Japan, and ever since I arrived and laid my eyes on the majestic conical beauty of Mt Yotei, I have dreamed of climbing and skiing it. 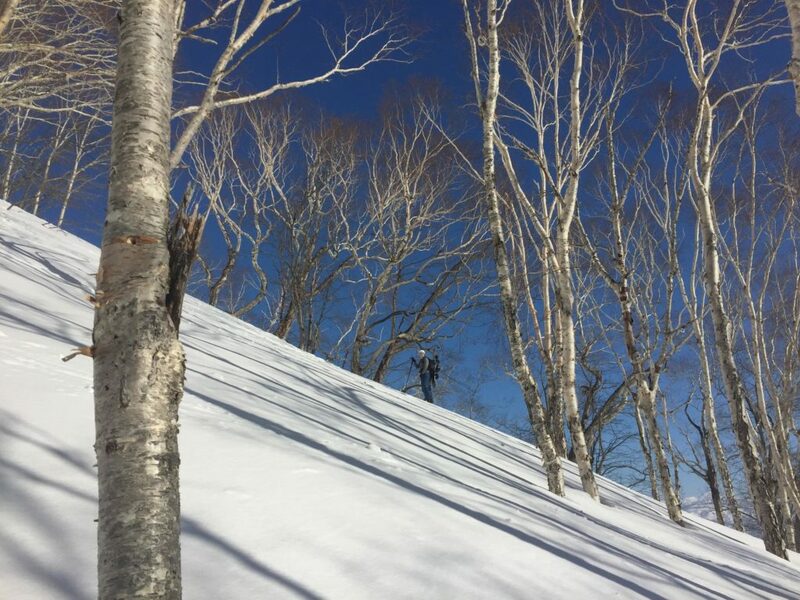 The snow in Niseko is like nowhere else I’ve skied. Regular top-ups of 20-50cm of light dry powder makes for dreamy silky turns and frequent tastes of the white stuff when it goes over your head. 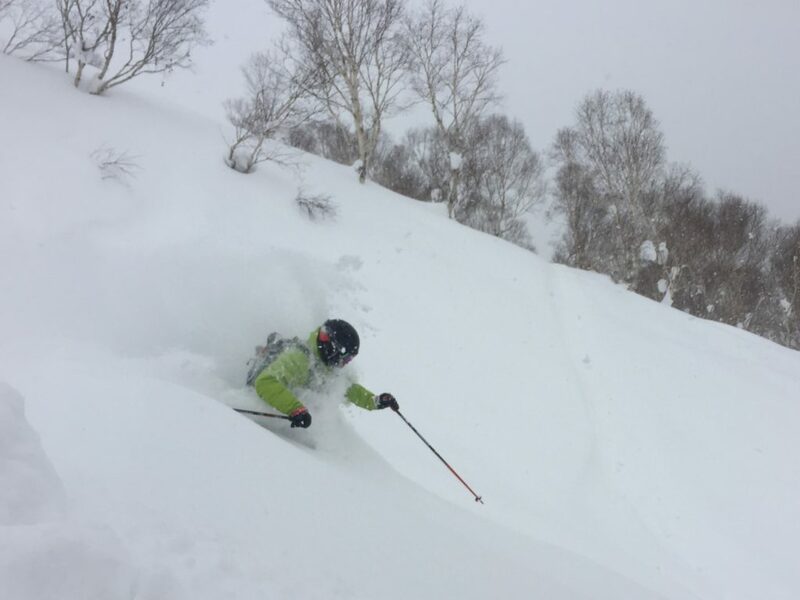 A good friend neck deep in typical Niseko sidecountry powder, February 2018. 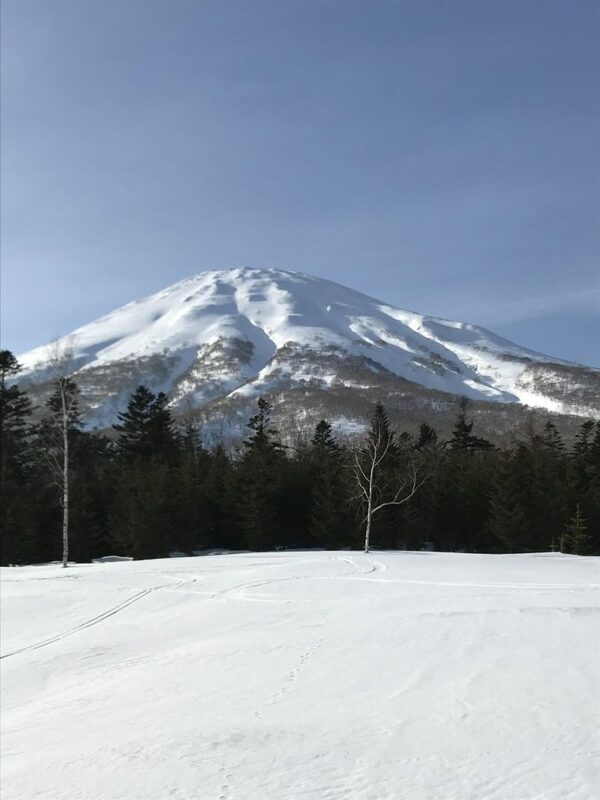 The further you go outside the resort, the less traffic is received and the deeper and better it gets, so I could only imagine what a powder day on Mt Yotei would be like, when you add another 500m of altitude to the top of Mt Niseko-Annupuri! I have always loved the thrill of reaching the top of a mountain, and the stratovolcano’s 1898m peak had been calling me for years. Last year I had to come back to Australia mid February as I was participating in a clinical trial for a new Cystic Fibrosis drug, so I wasn’t even in Japan for the Spring, when the weather is a bit more stable and clear days for climbing are more frequent. This year however, a window of opportunity presented itself in late March. I observed a forecast gap between weather systems about 10 days in advance, with clear skies and no wind predicted. I monitored it for the next 5 days and then organized a crew. Months earlier, my friend Adam had promised he would guide me if we had the opportunity, so I called him and he had a day off between clients. A couple of good friends were also keen to join me for their first time on Yotei, so we had a crew of 5. Dozens more colleagues were also planning to climb on the same day, so we definitely wouldn’t have the mountain to ourselves. 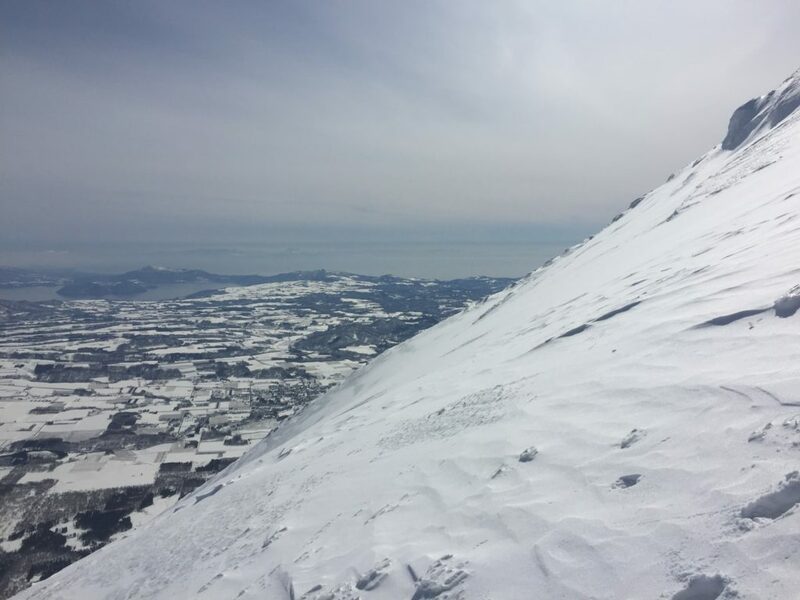 I had already bought a set of crampons to fit my ski boots as I had heard this was often required near the top, and it was looking like we would need them on this trip as the snow had been through a few melt-freeze cycles. 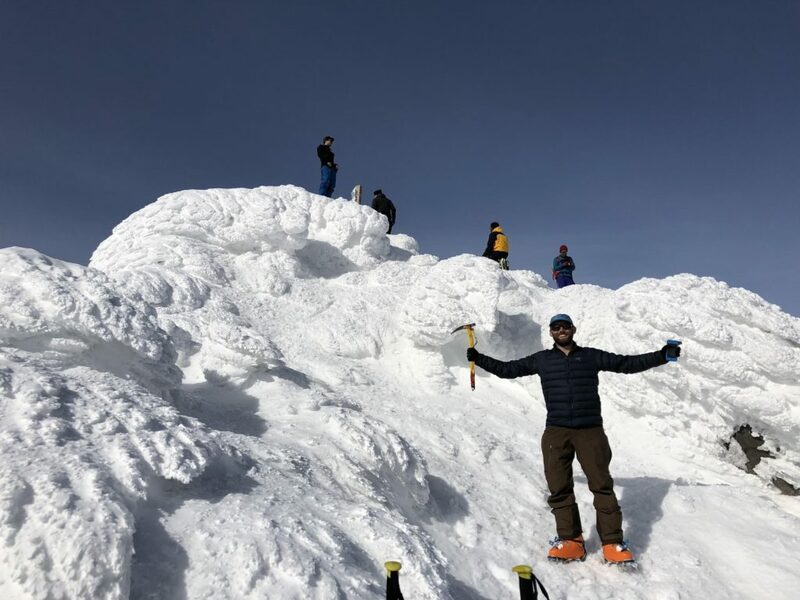 This was likely going to be more of a mountaineering objective than a ski tour, and we were all prepared that the ski descent may not be that great. There are a couple of route options when climbing Yotei, mostly based on your goals at the top. 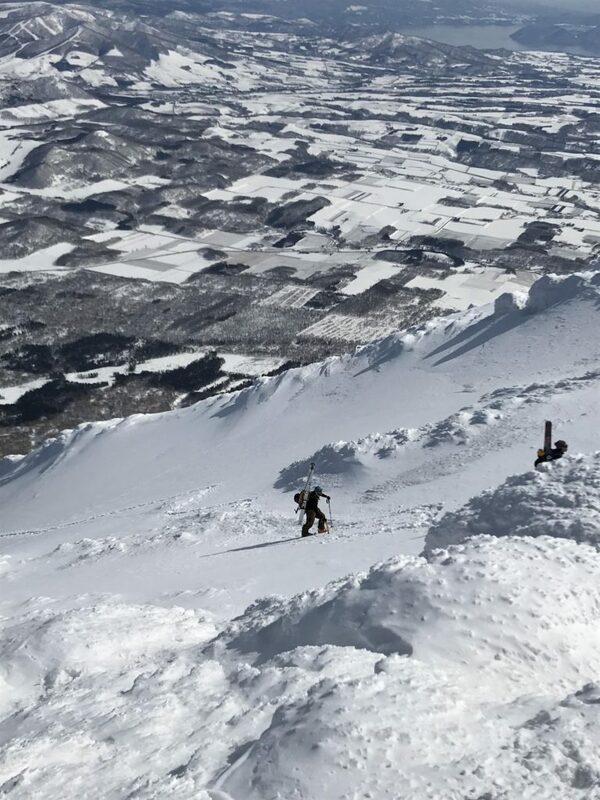 It is possible, and apparently rather wonderful, to ski the 150m of vertical into the crater when the snow is good, followed by a short skin out. This is typically approached from the south or west. 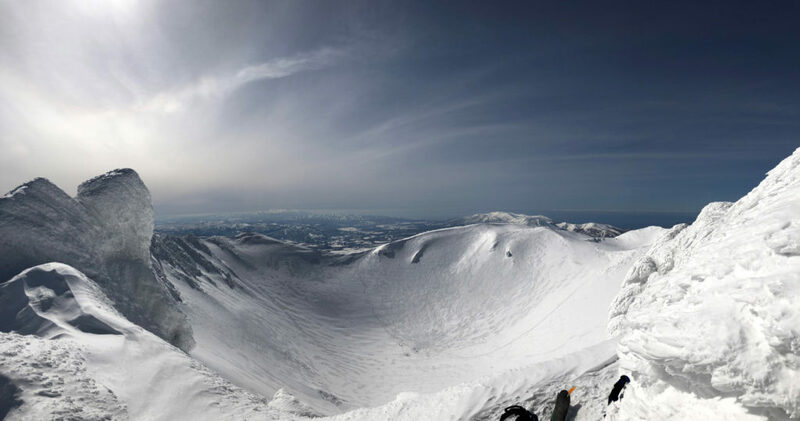 Another option though is to climb to the true summit on the East side of the crater. Climbing to the true peak was my goal, my companions were all happy with that objective, and it was a route that our guide and friend Adam was very familiar with. The dawn light reveals a cloudless sky, viewed from my bedroom window, morning of the climb. The day arrived just as beautifully as it had been forecast – not a cloud in the sky, nor a breath of wind. 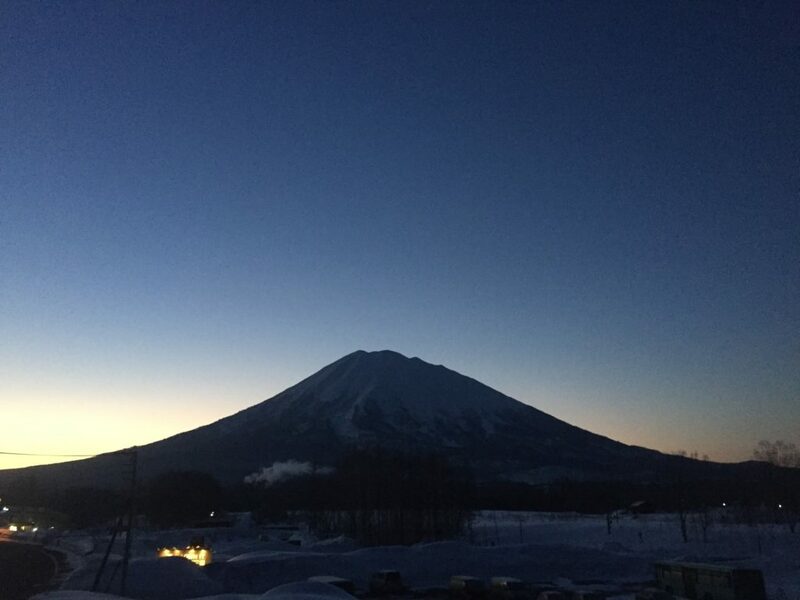 I peered out my Hirafu bedroom window which faced Yotei just before sunrise and marveled at her silhouette. Adam arrived at 6am to pick us up, boots on ready to go, followed by a mandatory visit to Lawson’s to collect lunch, and snack food and we were on our way – a 30 minute drive around the opposite side of the mountain to our roadside carpark. 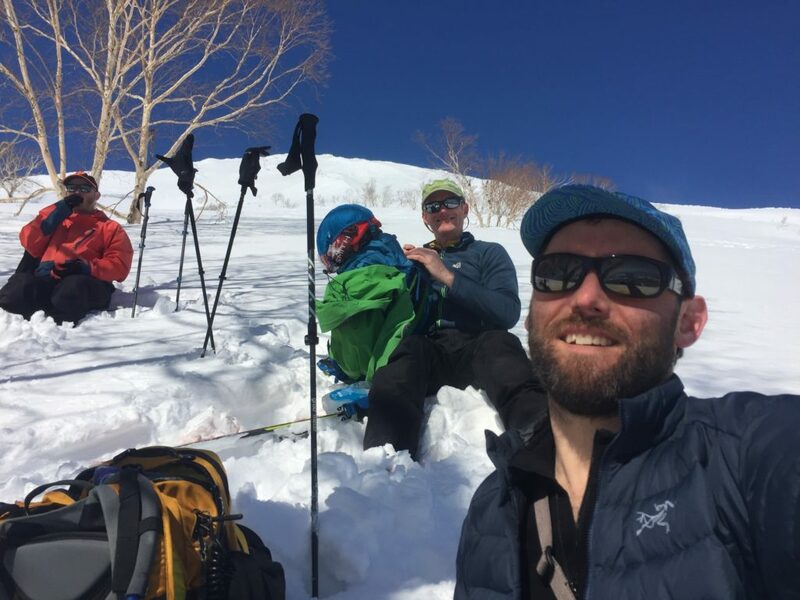 Finishing our coffees, we geared up, distributed ice axes, fitted skins and clicked into our touring skis or snowshoes and started off up the summer farm road toward Yotei around 7am. Warming up at a gentle pace up the summer road. Initially, the climb is very gentle, which makes for a nice warm up. Most of our route ahead was visible from down here, and it was pretty simple to choose a path through the forest, plus we had a guide who knew each little gully and ridge fairly well. Starting at around 350m above sea level, the initial skin to 800m was pretty easy going, with each of us getting into our own rhythm, some choosing a steeper line than others, and our token snowboarder who was climbing on snowshoes just decided to go straight up rather than the typical zig-zag that we skiers made. Ascending through the birch forests on the lower slopes, around 800m altitude. It was still early in the day and the snow was very firm after an overnight freeze. 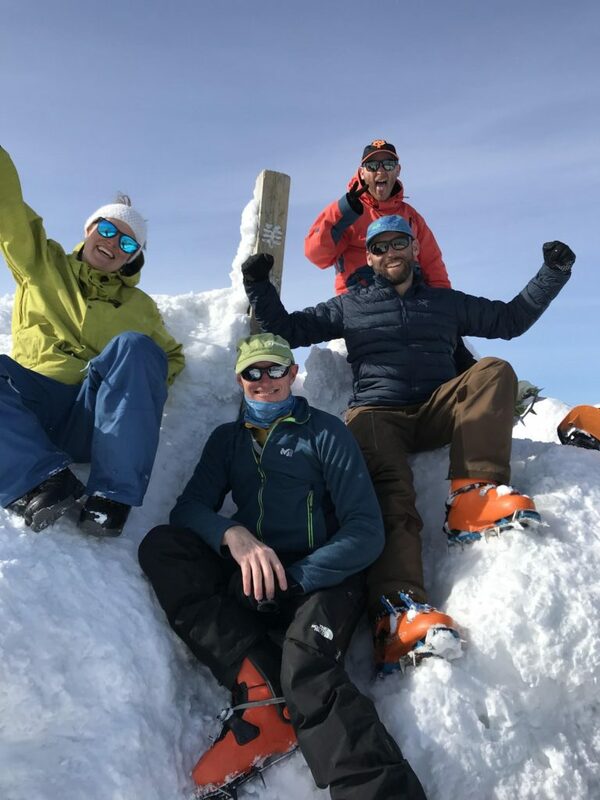 Our skins had been getting enough grip up to this point but as the terrain ahead was getting steeper, those of us who had them decided to add our ski crampons to the touring bindings. Ski crampons have metal blades either side of the binding toward the front that engage as you transfer weight to a ski, giving you grip on ice that wouldn’t be possible with skins alone. This was the first time I had used ski crampons and they proved very effective. After our ‘first lunch’ we pushed on up the ever increasing gradient with the goal of stopping again for a decent break at around 1100m. 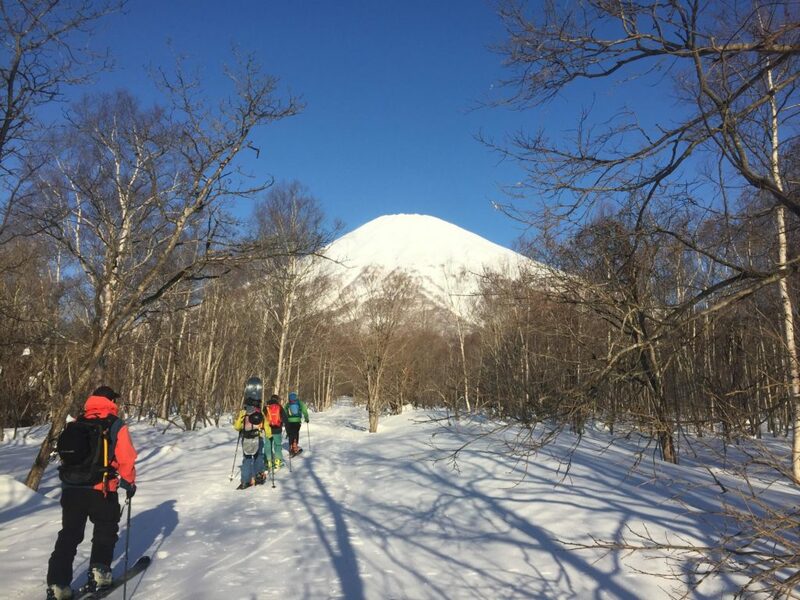 The trees began to thin out and we met two groups of local Japanese backcountry enthusiasts, the only other people we encountered on this Eastern route. The slope gradually increased, requiring systematic use of the variable-height heel lifters on our bindings. 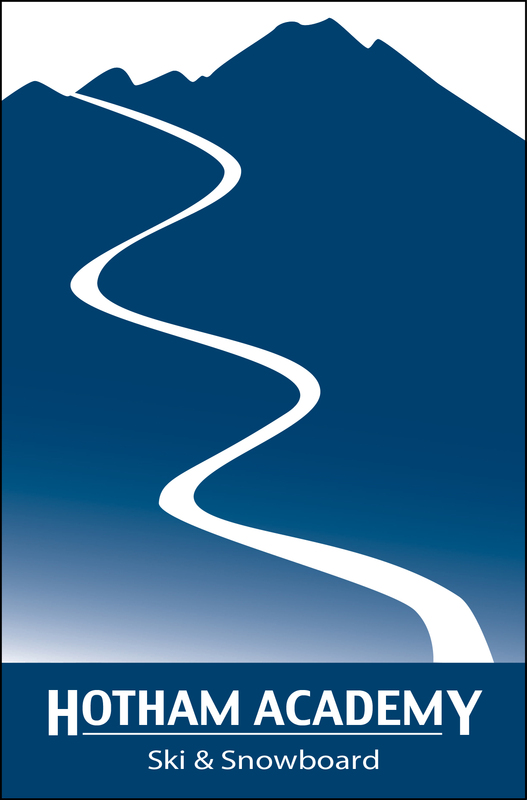 It is possible to deal with steeper terrain though, by choosing a diagonal route at a manageable incline, usually 20-25 degrees, depending on the cohesiveness of the snow surface. We made our ‘second lunch’ stop around 1150m which was about the treeline at 10am, consuming rice triangles, sandwiches and nuts and marveling at the great progress we had made in just three hours! Little did we realize just how steep and slow it was about to get! We pushed ahead using just skis and crampons for another hour before reaching a steep and icy face where we all started finding it much more difficult to get grip. I had a nervous moment when I slipped midway through a kick turn, sliding a few meters down the slope clawing myself to a stop with my gloved fingers into the icy snow! I needed no further coercion to make the transition to boot crampons. It was a difficult change-over though with nowhere to safely rest equipment on the steep slope, so I resorted to using my ice axe as an anchor for my pack as I nervously swapped skis for crampons one at a time. At around 1300m, we swapped skis for crampons. This was the first time I had used crampons and an ice axe for anything more than a practice walk, but found them pretty easy to use, preferring the ‘French Step’ technique to climb diagonally up the slope rather than straight up which I found was very hard on my calves. I developed a technique I was comfortable with, generally keeping two points of contact at any one time, using the axe to stabilize me during steps. Great views of Lake Toya and the Pacific Ocean to the South. The snow varied from 10cm soft wind-drifts to hard ice that even the crampon and axe spikes struggled to penetrate. My progress slowed significantly and the steeper terrain meant the performance of my legs was restricted by the limited oxygen availability from my 50% capacity lungs. I was very grateful that my companions were all aware of my need to go slow, and just waited patiently at periodic rest stops, giving me a little time before suggesting we push on. There were even some encouraging comments delivered over my two way radio to help spur me on. Despite the encouragement, the final hour certainly became a mental battle to keep placing one foot in front of the other when my body wanted to stop. I had a hydration bladder in my pack with mouthpiece accessible for frequent sips of water to keep me hydrated, and I would grab a couple of mouthfuls of trail mix about every 30 mins to keep the energy levels up to give my body the best chance of performing the task I was demanding of it. My final few steps to the peak, spurred on by my friends already there. The rest of the group made it to the peak about half an hour before me, but determined to stand on top of a bloody big volcano and take in the 360 degree views, I plodded up the final couple of hundred meters. 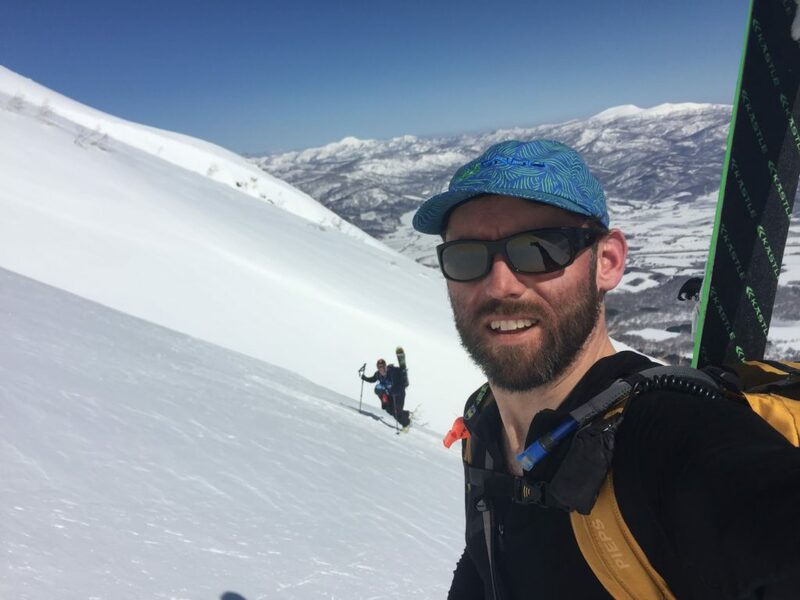 I arrived to cheers and tongue-in-cheek comments like “about bloody time!” and enthusiastically dumped my pack and skis in an alcove in the icy rhime that adorned the ridge and clambered the final few meters to the true peak, a traditional Japanese carved wood totem marking the 1898m summit. The summit was beautifully adorned with rhime ice. We made it – Exhausted celebrations! It had taken 7 hours to reach the top of this beast, and I had used up almost every last ounce of energy doing so. There was a little time to take in the view, snap a few photos, wave at the other climbers on a sub-peak to the south, and admire the tracks people had carved into the spring snow in the crater. But well before my legs had regained any sense of strength, it was time to transition to ski mode and head down. Some more chocolate, nuts and electrolyte drink were consumed, crampons and axe packed away, and we clicked into our bindings for the descent. Looking across at the tracks going into the crater it was easy to see why people enjoy that! By this time is was after 2.30 and the sun was rapidly disappearing from our easterly aspect. The face we were about to ski was quickly turning from spring corn back to an icy breakable crust. It was difficult skiing conditions, accentuated by my very tired legs, but it was over in about 30 minutes and we cruised down the access road we had ascended hours earlier. Leaving the shadows of Yotei behind us as we slide across a meadow near the road. Discarding ski boots and slipping my sweaty aching feet into my crocs was the best feeling ever, trumped only by the sense of accomplishment from conquering this bucket-list mountain. A big thank you to my patient companions for their encouragement and support. I have learnt that adventures like this need not be restricted to times when we are given an opportunity, but instead take ownership of the life you want to experience and create the opportunities to achieve it.